Dr. Michael Omidi is a double-board certified plastic and reconstructive surgeon. Dr. Michael Omidi specializes in cutting edge, minimally-invasive surgical and non-surgical techniques in breast, facial and body surgery and performs laser eyelid rejuvenation, minimally invasive endoscopic-assisted brow-lifts, endoscopic SMAS and mid-face lifts and suture-suspension neck-lifts. He also performs advanced techniques for body contouring such as mini abdominoplasty, Fleur de Lis and power-assisted liposculpting. In addition to specializing in plastic and reconstructive surgery, Dr. Michael Omidi is a fully trained general surgeon, burn surgeon and breast cancer surgeon. 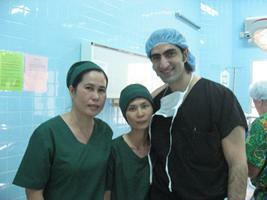 He also specializes in facial aesthetic surgery and pediatric/craniofacial reconstructive surgery.